Home / blog-en / What to do in case of a major CBRN incident? A very interesting review article has just been published in the journal “surgery”. It’s signed A. Calder and S. Bland and we can find him by following this link . Several major accidents involving a CBRN component have occurred over the past 25 years. These include the deliberate use of chemicals in Tokyo in 1995 (Sarin), Iraq in 2007 (Chlorine), Syria in 2013 (VX) and Salisbury in 2018 (Novichok). Accidents involving chemicals are much more numerous but they are sometimes insidious like chlorine overdose in swimming pools. Regarding organic products, the best example of voluntary use is the spread of letters containing Bacillus anthracis in the United States in 2001. In contrast, the Ebola epidemic in West Africa in 2014 spread naturally. The Polonium 210 poisoning in London in 2006 is a voluntary Nuclear/Radiological event and the Fukushima plant accident in 2011 is an involuntary act. higher risk for first aid: is there a risk of contamination? injuries often require specific treatment if they have been contaminated. Before hospitalisation, first aid was trained to manage this type of event, both in terms of communications between the various authorities and in terms of individual protection (skin protection and respiratory protection). All casualties should be decontaminated when they enter the hospital. However, in certain particular cases (non-recognition of the CBRN nature of the incident, an especially serious condition of the patient, etc. ), the injured may be taken to the hospital before being decontaminated, which may cause cross-contamination between patients and/or hospital staff. We note here the importance of the recognition of the CBRN character by first aid, and the perfect knowledge of the toxidromes involved in the triage of the injured in order to use the right antidotes at the right time, decontamination actions and the wearing of PPE. Hazards can be classified according to the toxicity of the substance involved: lethal, harmful, incapacitating and iatrogenic due to the effects of the antidote. They can be found both at home and in industry. They can have consequences ranging from mild symtoms to death. They are represented by household products, industrial toxins or even chemical weapons. They can be characterized according to: their toxicity (lethality) – quantity capable of producing clinical effects (itself depending on the route of entry), : their latency – time between administration and the first signs, : their persistence – physical property determining the risk of secondary contamination for the first-aid. In front of such hazards it is necessary to control the triage and the first aid actions and also to take into account a possible contamination of the personnel. They can be separated into living agents (bacteria, viruses, fungi) and toxins. Living microorganisms can cause simple disabilities (salmonella) to death (haemorrhagic virus, anthrax). These infections can also be contagious. Contamination can occur through sewage, blood or faeces. The approach is the same including confinement and decontamination. Living agents are characterized by their pathogenicity – the risk of causing disease, virulence – the severity of the disease, lethality – the risk of mortality, infectivity – the risk of infection after contact, transmissibility – the risk of contamination of one person by another. Toxins are chemical agents synthesized by biological organisms (bacteria, plants, animals, fungi). They can potentially be militarized (bolulinum toxin, ricin) or be the consequence of contact with the organism that synthesizes them (intoxication = bacterial infection with toxin). There can be intoxinations which are intoxications in contact with the toxin only preformed, the germ being then absent. Toxins are not transmissible. These 2 dangers are treated in the same way. Radiological incidents include ionizing radiation. 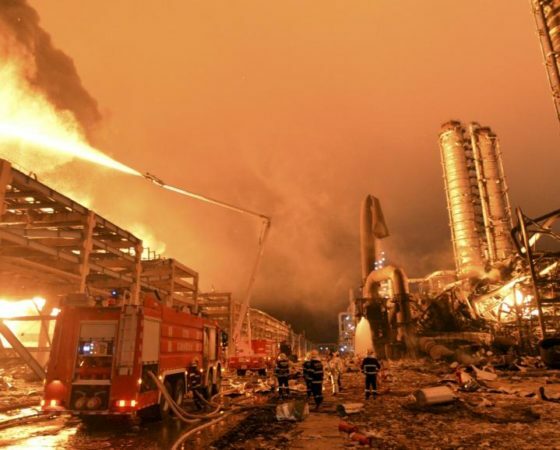 Incidents can occur at industrial or medical sites. The deliberate act can be done by means of a “dirty bomb” which is an explosive combined with a radioactive source producing injuries and radiological contamination. Radiation levels are generally low. Nuclear accidents are also radiological accidents associated with very high levels of radiation due to nuclear fission. Radiological sources used in industry and medicine can be associated with very high localized radioactive doses. 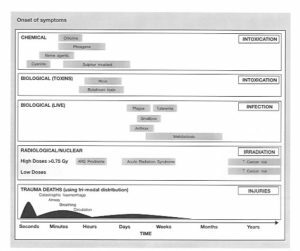 The following figure shows the occurrence of symptoms as a function of time and chemical, biological and radiological products. rehabilitation (physical, mental and social). evacuation to a safer area. We wanted to summarize this article here only in its didactic aspects, allowing the more specialized reader to read the complete article in a very specialized emergency medicine context. This entry was posted in blog-en and tagged biological agent, Chemical agent, Décontamination, Medical, Protection. Bookmark the permalink.